It is the corporate headquarters of Jones & Sunn, a large Mainland financial services conglomerate, but it looks like it exists in the world of Chaplin’s Modern Times. Never has the white collar workplace been so surreal, yet so uncomfortably credible in a Bloomberg bullpen kind of way. The impending IPO represents a heck of a payday for everyone, if by everyone you mean the charismatic chairman and his not so secret lover, the CEO, but Lehman Brothers complicates everything in Johnnie To’s musical adaptation of Sylvia Chang’s zeitgeisty play, Office (trailer here), which opens this Friday in New York, after premiering at this year’s TIFF. Yes, Johnnie To has made a movie musical—and why not? It is one more cinematic peak he summited. The music is not bad, but the design is simply extraordinary. Note there is no article before this Office. It is a strictly serious, high stakes environment. Ambitious junior managers like Sophie understand they have to move up or out, but there is not a lot of room above her. She has the ambiguous “support” of VP David Wang, who in turn is the “favorite” of CEO Winnie Chang. She is a somewhat scandalous figure for openly carrying on with the chairman, Ho Chung-ping while his wife remains in a persistent coma. Into this thorny nest of office politics come two fresh-faced management trainees. Li Xiang is a guileless go-getter, who somewhat charms Chang in spite of herself. Yet, the mysterious Kat probably has the inside track being the chairman’s daughter, working under an assumed name to avoid improper appearances. Frankly though, nepotism will be the least of everyone’s worries. At the risk of excessive repetition, it should be emphasized just how incredible designer William Chang’s sets look. They brilliantly blend the austerity of postmodernism with the expressionism of Fritz Lang’s Metropolis. Sylvia’s Chang’s narrative is unusually complex, but it is nice to see a film refrain from dumbing down the content. Of course, some themes are universal, like the corporate equivalent of the aging diva and naïve ingénue struggling to hold onto their piece of the pie. 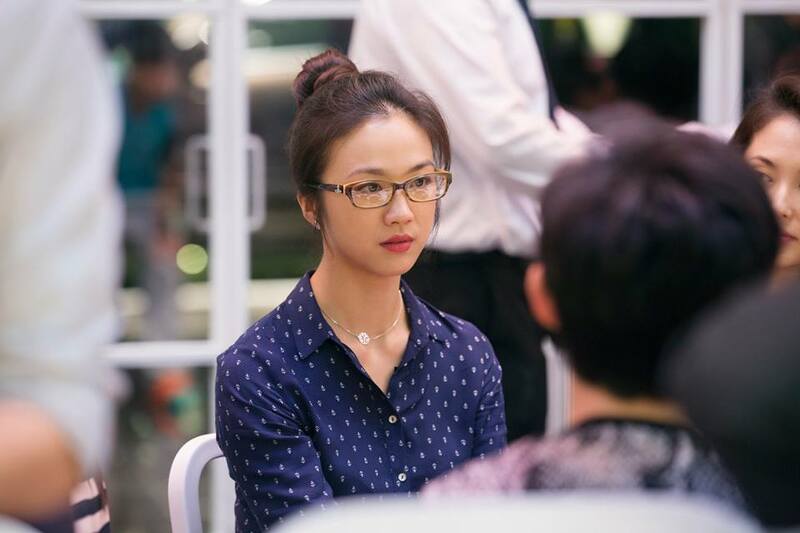 However, her source play resonated with Chinese audiences newly coming to terms with the salaryman blues in ways that will feel familiar to American viewers. Welcome to the party, its spectacular, isn’t it? In all honesty, the tunes are just okay, but Eason Chan demonstrates major vocal chops as David Wang. On the other hand, Tang Wei looks like she just wants to get through her numbers as quickly as possible, but in all other respects, her work as Sophie is sensitively rendered and deeply affecting. Still, Sylvia Chang clearly saved the prime cuts for herself, digging into Winnie Chang’s Joan Crawfordness with relish we can all share. She also develops some charmingly undefinable chemistry with Wang Ziyi’s Li Xiang. It is also cool to watch Chow Yun-fat strut his stuff as the chairman of the board, because that is basically what he is to Hong Kong cinema. When Johnnie To does a musical, you have to see it. It sounds fine, but Tang, Sylvia Chang, and William Chang’s eye-popping corporate HQ give the audience plenty to watch. Recommended for To faithful ready for his next departure and fans of the all-star cast, Office opens this Friday (9/18) in New York, at the AMC Empire.